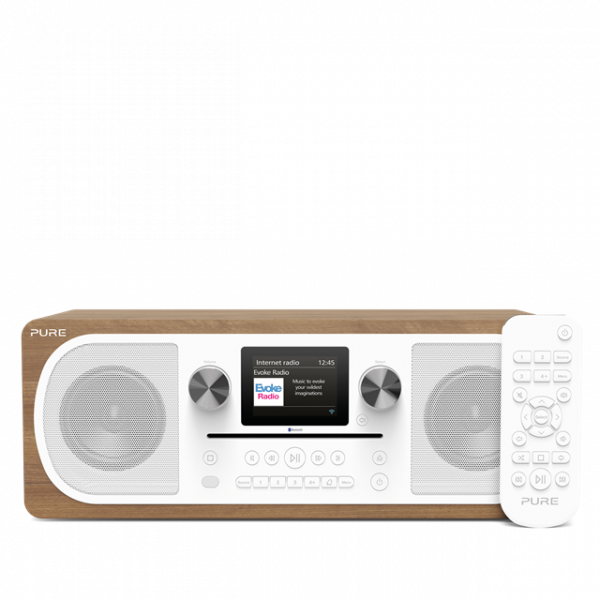 Product information "Pure Evoke C-F6 all in one music system"
Our all-in-one music systems combine digital radio, CD player and easy wireless connection to portable devices giving you a huge choice of listening. The space-saving designs with integrated speakers deliver ultra-clear class-leading audio and look beautiful with their clean styling and wood style finish. Our range-topping Evoke C-F6 also brings you the best of connected audio, with internet radio, Spotify Connect* and Bluetooth offering you an unparalleled choice of listening. Spotify Connect* gives you instant access to millions of songs on your Evoke C-F6, using the Spotify app on your mobile or tablet to directly connect and control your music wirelessly. Built-in Bluetooth lets you choose your favourite music and send it wirelessly, direct from your mobile or tablet. Give your music extra bass, depth and clarity so you can finally hear what you've been missing. Powerful tuned stereo speakers combine with the wood casing and the advanced digital amplifier to deliver class-leading audio. Whatever you love to listen to, you’ll love it even more with Evoke C-F6. You’ll love the ultra-clear, easy to read 2.8" colour display that displays extra information and brings a splash of colour to your listening. Despite the huge growth in music downloads, CD still offers quality and convenience that’s hard to beat and there’s something special about owning physical copies of your favourite albums. Evoke C-F6 includes a stylish slot-loading CD player with shuffle and repeat options, compatible with CD, CD-R and CD-RW discs. Internet radio lets you choose from the vast range of online radio stations. Discover new favourites from more than 25,000 internet radio stations including local radio stations from around the world, stations in different languages and loads of genre and even artist-specific stations to suit every taste. DAB digital radio brings you high-detail digital-quality sound, great content, much of which is only available on digital radio, and uses scrolling text to show you track titles, programme names and more. Digital radios automatically find all your available stations and let you select them by name, and all our digital radios also include FM for any stations that have not yet gone digital. Evoke C-F6 is also Digital Tick approved so you can rest assured that you’re ready for any future FM to digital radio switchover. Download the free Pure Select app (iOS and Android) and you can control Evoke C-F6 from anywhere in the house. There’s also a fully featured traditional remote control in the box. There’s also 36 presets for quickly selecting your favourite stations, a tone or radio alarm, stereo headphone socket and an aux-in socket which lets you plug in and listen to music from your mobile or tablet. Related links to "Pure Evoke C-F6 all in one music system"
Customer review for "Pure Evoke C-F6 all in one music system"